It would appear that mobile carrier O2 has mislead its iPhone 7 pre-order customers, many of them took to Twitter last night to vent their frustration with the carrier. At around 9.15 pm yesterday O2 started to text customers who had pre-ordered the iPhone 7 to let them know that they would not be getting their device on launch day. 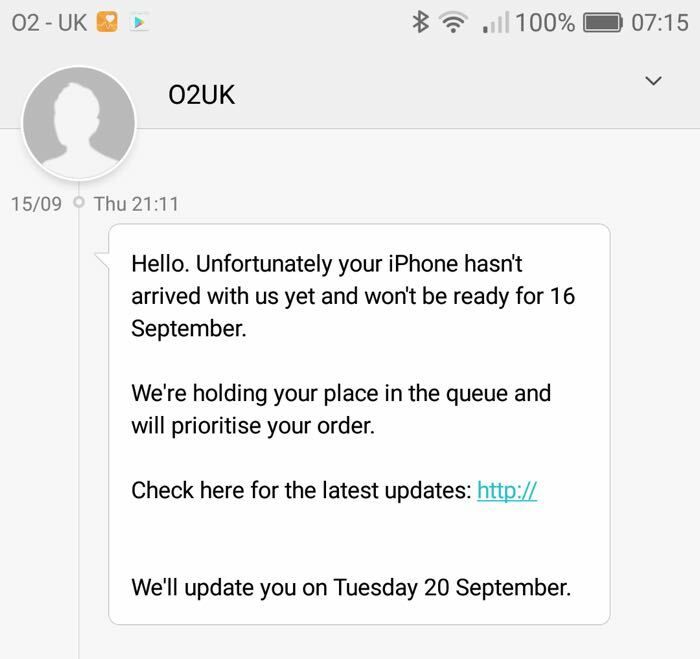 What makes this worse is that O2 waited until their customer service phone line closed at 9pm before letting their customers know that they would not be getting the new iPhone today. This meant that there was no option for these customers to telephone O2 and cancel their order, O2’s online support also appears to be offline and has for some time. O2 had promised these customers that they would be getting the new iPhone 7 on launch day, their website stated that the handsets would be delivered on the 16th and their customers were also told this by O2 support. I am one of these customers who has pre-ordered the iPhone and was told numerous times throughout the week that I would be getting my device on Friday the 16th of September. Like many other people who had pre-ordered the handset from O2, I got a text after 9pm last night letting me know that I would not be getting my iPhone today. Now I have no problem waiting for the new iPhone for a few days or a week or however long it takes, what I do have a problem with is O2 thinking that it can just lie to its customers and think that everything will be OK, it wont, they will end up losing customers. O2 must have known before 9PM last night that many of its customers would not be getting their device, why wait until their phone lines are closed to tell them? There appears to be no pattern to which customers are receiving their new handsets and which are not. Both myself and my wife pre-ordered the new iPhone 7 from O2 last Friday at the same time. Luckily her iPhone will be delivered today, I will have to wait until next week to find out when mine will arrive. You can see some tweets from less than impressed O2 customers who had pre-ordered Apple’s new iPhone below. We suspect that O2’s customer service department will be very busy when it opens at 8am this morning. Every year we see great demand for the latest iPhone, but unfortunately this year there has been a market wide delay in receiving iPhone stock. This means that while most of our customers who pre-ordered will receive their new iPhone today, some will experience a short delay in receiving it. We’ve contacted them to explain we’ve held their place in the pre-order queue and will get it to them as soon as possible. We are sorry for the disappointment this has caused our customers. @O2 will you be refunding my £59.99 upfront charge due to the delay on iphone 7? I think you should after all the mis-advice/lies. Thoughts?